Mayor de Blasio, Our City Is Not For Sale! “Business as usual” is transforming New York City as we know it. Every neighborhood, every block has its own story of political quid pro quos that have resulted in out-of-scale, out-of-character development from which a few profit richly while many suffer greatly. Brown-bag your lunch and please join us tomorrow, Wednesday, May 4, 2016, at 1:00pm, for a press conference in front of City Hall! 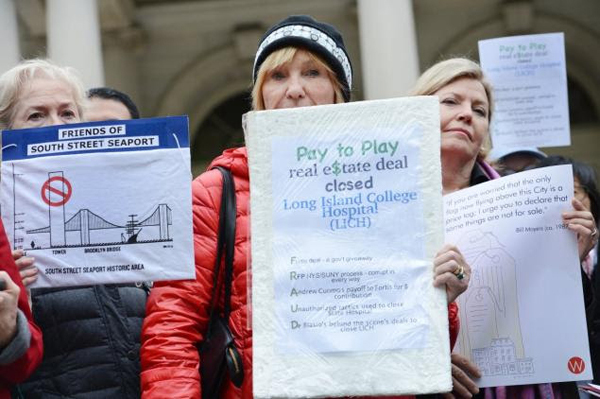 Community groups and individuals from across the city are uniting to demand an end to the “pay to play” relationships between real estate developers, lobbyists and City and State government. Please contact us to add your group to this growing list!